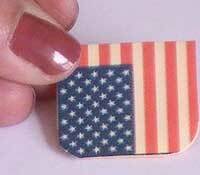 If you are looking for a 4th of July patriotic treats project, try making some of these cute little treats. If you work in an office you can fill a small bowl or decorative jar and leave it on your desk for your co-workers to take and enjoy. 1. I will be putting a link here for you to download the same paper I have if you are not able to design your own. 2. Round the corners of your flags, this isn't something you have to do, but I thought it looked better rounded. 3. 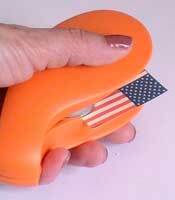 Fold your flag in half, using a bone folder to make sure you have a nice crease. 4. 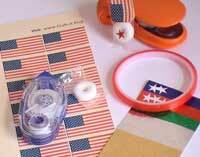 Place adhesive on the lower half of the flag, on the other side of the red stripes. 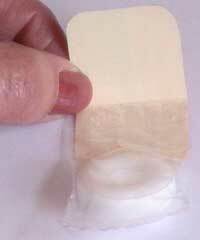 Line up the lifesaver plastic wrapper to the crease and press it to the adhesive. 5. 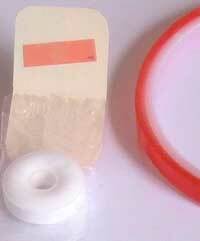 Add double-sided sticky tape to the upper half of the flag and line up the plastic wrapper of the lifesaver and fold it over to meet the adhesive. 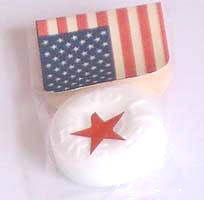 Then take a small sticky star and place it in the middle of the lifesaver while holding the top of the flag down. And, you are DONE! YAHOO! This is a great craft project. 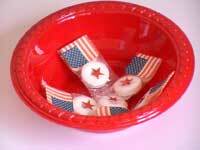 Now, put your little patriotic treats in a cute bowl on your desk or on the picnic table!